It's time for another Wine Blogging Wednesday. It's been a couple of months since I've participated in a WBW event, but with this month's theme, Washington Cabs, how could I resist. Our host for this month is Through The Walla Walla Grape Vine™. I really wanted to like this wine more because I thought it had great potential when I bought it. Granted I drank it about 5 years before I was expecting to. When I first tried this upon release, it had lots of acid and massive tannins, so I thought it would be an ideal bottle to lay down. 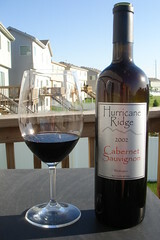 There was a good amount of sediment adhered to the bottle and I needed a Washington Cab to drink for WBW #34. So I opened it. 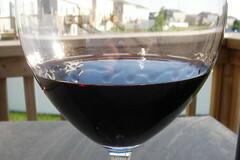 Currently it still has lots of acid and tannin, though the acid seems to be more prevalent than the tannin. You get a brief attack of tannin up front, but the middle and finish are dominated by the acid. Definitely need food with this. Luckily I had an 8oz. ribeye steak to stand up to it. Tried straight out of the bottle, through a Vinturi speed decanter and a regular decanter. None of them produced the results I was hoping for. It was difficult to find the fruit in this wine. As such, my notes are a little vague. Gorgeous blackberry juice color. Very oaked with a charred vanilla bouquet. Darker type nose of chocolate, dusty leather with a touch of barn. Taste profiles of raisin-y fruit, blackberry, black cherry. I'm still pretty new to aging wine, so I'm not sure if this was aged too long, not long enough, if it was going through a "dumb" phase or what. Anyone have any insights? If you'd like to see then entire WBW round-up, you can find it on the Through The Walla Walla Grape Vine ™ website. BEER REVIEW: Upstream Brewing Co.